I’m generally not one to shy away from a new DIY challenge, but I have to admit…I’m a bit nervous about cutting the top portion out of my doors for glass. I’m going to do it, but I couldn’t quite work up the nerve to do it yesterday. Perhaps today I’ll be braver. I did have some people ask me yesterday why I was even going to add glass if the (new) purpose of the doors is to close them at night for privacy. Really, the only answer I have is “because I have my heart set on glass.” All along, I’ve had this idea of adding French doors to those doorways. Obviously that’s not going to happen, but I don’t want to completely give up the vision of having doors with glass. But just to see what solid black doors would look like there, I photoshopped a mock up of solid black doors. Again, note that these are not my actual doors. I just found a photo of a black six-panel door and copied and pasted it onto my photo. I won’t have door knobs like that on my doors. I’ll have large pulls instead, if I can find any that are reasonably priced. And my doors don’t have raised panels like this door has. I also copied and pasted the trim on top. I haven’t actually framed and trimmed out my doorway yet. Anyway, I think I just fear that solid black doors on these doorways will look pretty heavy and overwhelming. I can handle a single black door surrounded by white trim. In fact, I love that look. But two solid black doors on one doorway just seems a bit much to me. I really love the lighter look that glass gives. I can still have black doors, but with the glass, they don’t look so heavy and overbearing. So I’m considering three options for the glass on top. The first is a single large pane of glass. I love that that option looks so clean and simple. There’s nothing fussy about it. But then I wonder if the look is too commercial/institutional. The second option would be six panes of glass that are equal in size. This option is definitely the closest to my original vision of putting French doors on these doorways. I think it’s really pretty, but does it kind of give off a “country” vibe? Because that’s the last thing I want, especially right there next to my kitchen. The third option is nine panes of glass of unequal size. Lately I’ve been watching Upstairs Downstairs, probably in an attempt to find anything remotely Downton Abbey-esque since we still have a long wait for new episodes here in the U.S. It’s an okay show (definitely not even close to being as good as Downton Abbey), but I love looking at the set designs. I saw a door like this on the episode I watched last night (it even had the two panels at the bottom like my door has), so I thought I’d try it out. I like it! It’s different — not as predictable. EDIT: A few people have mentioned that these doors would be nice in a different color other than black since they’ll be so different from the other interior doors. I actually agree, but the problem is that I just can’t think of a color that will work. They’re right next to my kitchen, with very green cabinets, and I want these doors to be the same color as the doors that will go on the doorway between the entryway and music room (when I get that wall/doorway built). So the color also needs to go with dark teal. I know I generally don’t like the whole “shabby” look, but for some reason, on these doors, I wouldn’t mind the look at all. Kind of like I happened to find four old matching salvaged doors. But these doors have new wood around the edges, and I’ll also have door knob holes to patch. So those are also considerations in deciding how to paint them. DIY Pocket Door Bookcases – Finished! Those last ones for sure! A bit different and not so country. I agree! Number three is my favorite! See you say not so country and yet my brain is saying country cottage for those same doors. Funny how so many people see things in multiple ways. They are my favourite of the three as well. The last one! But would you need to really have multiple panes of glass or could you just put one in and float the wood pieces on top? #3 doors are awesome! #1 looks too much like dr’s office or lawyers doors. Plus #3 design would look great with the artwork you have planned for the kitchen. When I think “country”, I think of a white door with either 4 (2×2) or 6 (3×2) panes of glass always in 2 rows at just about eye level So, in my opinion, both the second and third option are fine. The one with no trim makes me think of grade school classrooms. Colors that go with both green & teal include many of the true blues, from Cornflower or Periwinkle, to Sapphire. Midnight might make things too dark. 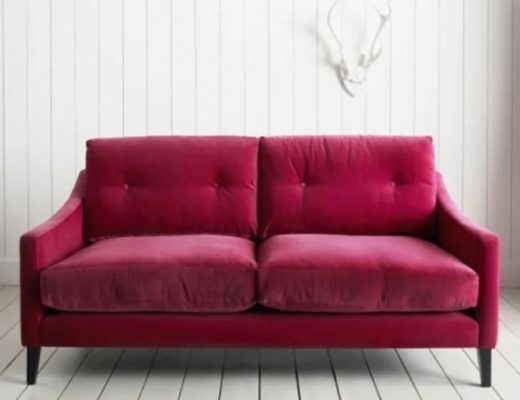 You can also use a few of the reds with a bit of blue in them, like rose or burgundy. You can use most of the purples as well, lilac to amethyst to royal purple. You could also use something neutral like taupe, khaki, grey, off-white, eggshell…. Me again (sorry). #3. Maybe just paint the stripes on instead of using wood. That would be way easier and you’d just gave one pane of glass to handle. Or maybe frost the glass all except where those stripes would go. Just some ideas to make it easier and more interesting. I like the last option #3 and I agree about not having doorknobs but rather a decorative handle of some kind something like you might put on a kitchen cabinet. I love the two last ones. But in your case, I would choose the last one. I think it will go well with the rest of the house and it isn’t too country. It has that little ”Je ne sais quoi” that makes the difference. I love the 9-pane door! I totally agree that having just the doors would make the room seem small and boxed in. I love the idea of adding glass, even if it is a frosted glass. One option that might be a bit more expensive, but what about stain glass? The first thing I thought before reading this is “she got the doors painted yesterday? Holy moly! !” I like the first option the best, it is just such a timeless look. I agree the second one is way to country, and the third is very nice. I just don’t think it is compatible with the windows in your house. Unless you are going to be getting new ones? I know what ever you choose will be awesome and you will make it work. I like that last ones too, but I like stained glass. That might be too much though. And on another note, Downton Abbey wouldn’t exist without Upstairs, Downstairs, which was considered revolutionary in it’s days. Much as I love quirky English TV, both seem to go on longer than I have patience for. But the locations are wonderful! Def not the first one…looks like an office entrance or something to me. I like the third one best. I really like your idea Molly. #1 looks commercial, not residential. I like Molly’s suggestion best. My favorite! I can see them painted black. 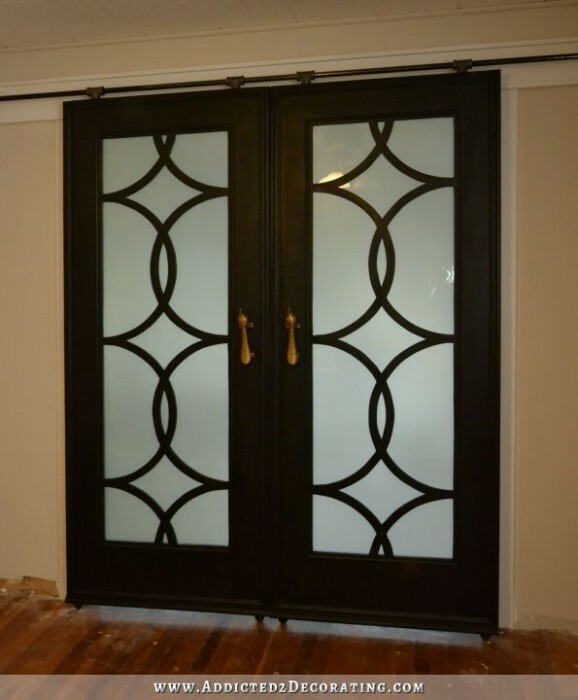 To me, these would echo the feel of French doors as well as repeat the panels of the other doors in your home. They would be different and yet still in harmony. I sure hope you choose this option! This, or glass in only the top four panels. #3 gives a whole different design vibe that to me is not compatible with the rest of your doors or the kitchen in the next room. That is exactly what I was picturing. Molly’s idea is my fav! It would also echo the kitchen cabinets that have glass. I love Molly’s idea. This is what I was thinking, as well. I was also thinking that if you didn’t want to put glass in all the panels, you could put it in just the four top panels and have the bottom two solid. If I were picking from the three designs you chose, I would definitely choose #3. It is the most interesting and unexpected. I vote for Molly’s choice as well, definitely! I was having trouble making up my mind, but after looking at the doors you’ve suggested, Molly, I like that even better! I love this idea, Molly! I love the black doors, but when you add glass at the top,it really reads front door to me and seems out of place. By adding it to the top and bottom, it makes the doors seem more suited for this placement. Just my two cents 🙂 Looking forward to whatever you decide to do. I know it will be lovely. Really a beautiful idea! Like this best but also at first loved the solid door. I’m with Kimberly on this. The paned barn doors look a little too much like exterior doors to me. I would also cut out the top and bottom panels of the doors and replace it all with a large piece of glass. IT woudl be a much lighter look and again more like french doors. So basically a glass door with a wood frame. I was just trying to Photoshop this idea when I looked at Molly’s link to Houzz. I like this idea the best with just 4 on top as a second. Molly, I agree with you! That would be my first choice, then option #3 a close second. It’ll be fun to see what you decide to do, Kristi! I think the first one is too plain for all of the beautiful details you’ve added to your home thus far. I think #3 is best as others have thought, however, I was thinking more along the lines of what Molly suggested above, having glass above and below. Either the second or third option. The first one looks too institutional. I immediately flashed on my very old (cause I am) former elementary school principal’s office door. And you have your heart set on all black doors as I remember. Just wondering if these are truly very different than your other doors, why not follow that with paint as well. Possibly the wall color or a shade off? I love the last design! Number 3 is the classiest. Plus it sounds like they remind you of something you like. And that’s the best stuff to include in your home. My mind has been seeing 2 glass panes in the top recesses and 2 glass panes in the middle recesses. I thought that was your original thought. LOL I like that look because it keeps the doors consistent throughout but with glass instead of wood. But out of the 3 choices I like number 1 best. BTW I also thought that you had painted the doors. I thought “Man she is rocking this project!” painted doors AND TRIM in 1 day! Whoa!!!!!!!!!!!!!! LOL Can’t wait to see what direction your brain takes you! I agree with shelia. Remove the recesses but keep the stiles and rails and add 4 panes of glass, maybe with a beveled edge. 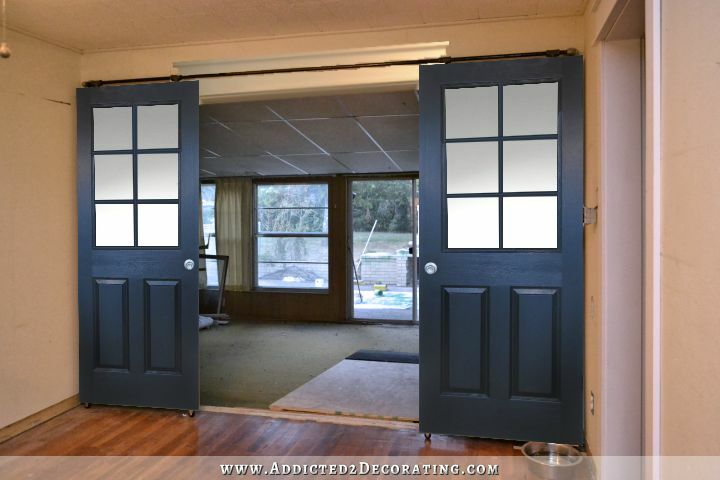 I also think these doors need a special paint treatment, maybe the color of your kitchen cabinets? Or just striped raw and waxed or something like the inspiration pic you first showed us. I just think a pristine new paint job would make these doors look to new and off the shelf instead of a cool reclaimed architectural find. that would be my favorite too! That was my thought also. Use the original configuration of the panels and put 6 panes in each door. That way it is original to the door design and more like French doors. I love #3 also. It’s classy and seems to flow with the feeling of the kitchen. I like the idea of using wood to define the “panes” and with your skills, would be an easy thing to do. However, I’m not sure if you’re thinking of doing the trim at the top like the rest of your doorways, but I think it’s too much with the rail at the top of this particular door. Just my opinion! Love the black doors! I sent you an email of a mock up idea I had. Only put glass in the middle section, leaving the top and bottom wood panels. To me it seems to match your unique house style. I agree with Tina G, first thing I thought of was a Doctor’s office door. Either 2 or 3. Could you put glass in the bottom panel too? Would look even more like the French doors you originaly wanted. Kristi, I prefer option 3 personally. Just one thing though, the trim above the door, whilst I appreciate it is a mock up, have you considered extending the trim at either side so that when the doors are open the trim extends the full width of the open door. A matter of personal preference once again. Also with regard to my previous comment, could you add a piece of lumber (lump of wood in UK English) one inch wide, and the thickness of the door with an oblong hole cut in to accommodate the casters, which would save moving the top rail . Oooo… #3 for sure! It just looks so elegant and homey. I love the third option. Country?? Not to my eye what so ever! If it was anything (subtle hint) I would say arts and crafts/mission. To my eye anyways. You could just put the strips of wood on top the one single pane. I have seen that done many times. As far as having your ‘heart set on’,,, hmmm where have I heard that before?? Oh yeah! When you were discussing the stripes on your brand new oak floor. Hearts are fickle, and not always practical and are very changeable. I hate to see you make more work for yourself. But I do love the third option you presented. Will you add a strip of trim to the bottom of the door to hide the rollers?? That light streaming in under the door would bug me. But of course your not me! lol Good thing cuz I could never do what you do. You rock!!! I meant at the bottom of the doors, not in the doorway. So there would be no hinderance. A strip of trim on the bottom of the DOOR hiding the view of the rollers, but not hindering their movements. I don’t know how to say it anyother way to make my thoughts clear. Would the doors be too weakened if you installed both top and bottom panels? I like the third option for half glass doors, but two six paned panels would be elegant. Whatever you choose, the doors will add so much light to the spaces–great idea. Definitely #3. The first looks like an old hospital door. Love the black! I think the single glass gives the doors too much of an exterior look and gives the impression that the doors are and exit to the exterior of the home. I think panes at most if you want the glass to let in light but otherwise I actually like the doors with no glass at all. I was thinking the exact same thing. I really do like the solid black wood doors. Those seem like “interior” doors to me–and they will be slid open during the day, right? The doors w/ the glass on top scream exterior doors–no matter which version (all glass, 9 pane, prairie style). I do like the glass replacing all the panels…that would seem more like french doors. Is there any issue of safety with all glass and a wheelchair? The older I get (and w/ disabled parents) my mind keeps thinking “universal design” – ease of use and safety issues. And finally, do with a different textured glass rather than the frosted. Ribbed, wavy, seeded. The options are endless and could be an awesome way to add character. On a side note. New episodes of Downton Abbey are available on Couchtuner dot com as they air, long before it is available here in the US. No need to wait! What if you cut the panels out of your doors and replace them with frosted glass. I think that would keep it light and give you the privacy that you are looking for. You could even cut out the bottom panels as we’ll. just a thought. Here is what I was talking about. Obviously, your doors have smaller panels, which I think is better anyway. My advice would be to complete the install without glass, live with it for a while, and then retrofit the glass as your heart and design sensibility dictates. Having maintained French doors for 20 years now, and as a woman who is not especially fond of cleaning windows, I promise you it will be a win if you find you like the look without the glass. But the heart wants what the heart wants, and I can’t say I always or even usually make the practical choice when it comes to decorating. Also, consider the view. Maybe the time for glass is when your back rooms rise to the top of your list. As a long-time reader, first-time commenter, I have to add that I really admire you and your work. You’ve got great vision, taste, and mad skills. actually, my favorite is the way it looks now, without a glass panel. My next favorite is the third option with 9 panes. I love the idea over all!! I LOVE the third option but truthfully any one of them will be beautiful. My husband made me a “barn” door for our pantry but I like yours better so I forwarded your E-mail to him – maybe at our next house. Kristi, you are so supertalented. Can’t wait to see how this all turns out. I like both #2 and #3. While my personal preference is #3, I can better envision #2 in your decor scheme. Don’t care for 1 or 2 at all. Love #3, but I also like Alta’s idea. I really like #2, it doesn’t give off a country vibe, I think because your doors will be black. Coming in second, I would pick option #3. The first option does have an office feel to it. #3. I was surprised that you only included glass on half the door in all of these – full-length glass seems more like a French door to me. #1 seems like a Lawyer’s Office, #2 is pretty country, because of the half-length, and #3 is unexpected. One thing that would make #1 appealing is to have textured glass. My French apartment had that and I thought it was gorgeous – privacy without the frost, and it went so well with all of the old touches (the building was only from the 1930s, I think). The third option is my favorite!!! Reminds me of the gold trim in the kitchen but done in black on the glass!! I love following your blog and how you do all the remodeling you do!!! It is beautiful!! I’m gonna go with the “in”: crowd and say #3. I just love the look! I’ve been looking around my house that there is not a single doorway in my house where I could put a sliding barn door! All the doors inside the house have short little walls on either side. I take that back, there is one spot but it already has a pocket door and it is where my piano sits so I’d loose too much space by moving the piano away from the wall so the door could be functional. Plus it is into the kitchen so there isn’t much need to have a door for privacy since you’d have to walk through the rest of the house to get there. Darn! I was really liking this idea! I’ll just have to admire yours! I was kinda surprised by these choices…for some reason, I envisioned simply replacing the panels with glass…NOT removing the rails/stiles that create the original door design. Have you considered just doing that? …with Alta and the links she shared! Sorry…hard to post today for some reason! I am going against the crowd. I like 2 best. Three is great, but I think two fits your original idea best. I think by painting them black you will keep them from looking to country. I much prefer option 2 for your design. Option 3 looks more oriental, and won’t go with the rest of your home. For me, it’s original which I love or #2 all day long! I love #1 and #3. but I had a thought, why don’t you choose #1 and go for a etched glass look or even frosted etched glass. You could then take your amazing DIY skills and design your own etched patterns. Something along the lines of this for an idea. that’s a fantastic idea! you could go for a less romantic/classic design – etching glass isn’t that difficult! Apart from that, I like option 3 best as it’s a bit different. I can imagine that Molly’s idea, though very pretty, might a bit daring with Matt being in the wheelchair – it might be too dangerous to have glass panes down there? Hope that thought s not intruding too much, of so, sorry! #1 makes my skin flinch – all I can think of is the glass shattering from some kind of impact and then imparting deep wounds to someone. My vote is for panes in some kind of configuration. I always wondered why you didn’t want to just replace the panels with glass, but you know your own taste better than anyone else. Now that you know the doors are not hollow core, it might open up more options for you. Good luck! You do a great job and have way more energy than I do. I see that everyone likes the 3rd option the most. But I like the 2nd option. I just think it’s more appealing and hat glass portions are big and overwhelming. But it depends on the styles of the room it is connecting too. What feeling are you trying to create in those rooms and will the glass panels go well with that concept? Hmmmm…. I LOVE the 3rd option the best. It’s clean, but still has a lovely decorative feel to it! I agree with others that #1 is too commercial-looking. I also agree that black solid doors with no glass would look best for interior doors, and I don’t think it would be too much black. If you really want glass, I prefer #2 for the style of your home. It does not look “country” to me, maybe traditional. On the other hand, I do like the prairie-style windows and used them in my living room in the front of the house, two double-hungs that are bumped out like a bay. My house is traditional/country and although the windows don’t match anything else in style I do like them. The installer recommended them to add something extra to just plain windows. So they might look great for you. My opinion is: the 2 examples of “with glass” look like exterior doors, nice looking but NOT anywhere close to the look or feel of INTERIOR ‘French Doors’. I had an old house with an addition on the back (sloped ceiling and all). We added French Doors to the opening, and loved the feel of open and extended spaces. (We had no neighbors behind + privacy fence so didn’t “need” the glass to be frosted or covered, we did have covering on the wall of windows in the sunroom, more for looks than privacy. The French Doors were left clear and uncovered. My suggestions are: (1) Extend the “kitchen” look onto these doors (green w/gold leaf), since you’re having 2 sets of doors closing off this area, why not do the ‘INTERIOR’ side of the door one way and the ‘EXTERIOR’ side of each another? (the Living Room side BLACK, the Sun Room side …. ? Black or whatever accent color you decide? (2) Since you’re such a wiz at the bumpout and replacement of cabinet panels, why not do the same with your doors if you really want the “feel” of French Doors? Keep the old doors and insert glass only in the recessed panels. I’m sure you could figure out a way to install the glass so it was (possibly) recessed on one side and Framed In on the other? By doing this you could use clear glass and still have the feel of privacy. The reason for these suggestions is the idea of having the feel of openness, the view that goes on ‘forever’ with the option of separate and private. I like the third option also, but for your house I think I would go with the first option, which I really like also. When you take into consideration all the different doors and windows that are adjacent to these doors, I think the simpler option is the better fit. I don’t think they will look like office doors when everything else is in place. To me the third option, while beautiful would take the house in the direction of craftsman or turn of the century. Also, that is a lot of black, not just a touch and the first option is the lightest looking to me. You’ve done a great job on them so far, they will be wonderful whatever you pick. I like both 2 and 3 only because that room will need the light. I have a few questions…. are you doing both sets (this set and the set on the other side of the room) of doors the same way? What do the doors look like closed from the Sun room? Would it make more sense to put the doors on the other side (in the sun room) so that they have more room to open and close? Have you thought of doing the large pane and then doing some glass etching in a design that speaks to you and Matt personally? I’ve seen some articles where they have done large trees, Moroccan designs (similar to fabrics that are popular right now, linked prism type designs, really the sky is the limit. There are directions all over Pinterest on etching glass. #3 reminds of modern Craftsman design and doesn’t lend it’ self to the design of your home. #1 & #2 are too plain for you as is. JMHO. I have door #1 in my pre 1885 farmhouse as front and back exterior doors (original) and they suit me fine but looking at them and imagining them as interior doors just doesn’t strike me as something that has your flair and your style. They will be huge statements in your home and should be really specific at making a statement that says “US”! Even words or poems to each other would be lovely. They don’t each have to have the same design. Last option. Shapes echo the kitchen cupboards’ panels. Nicer flow from the very bold/large doors into kitchen/dining areas. Unifying. I love the third one! I was thinking, what if you use curtains instead of glazed glass? You could change out the curtains if you’d like, giving yourself possibilities. You could even choose whether to have them open or closed. Maybe some unexpected pops of color… I dunno. Love these doors! What if you put fabric on the windows?! The right lace pattern and color would be beautiful!! I also really like the gold and green on these doors as well. Kristi, of the three, I prefer #3, but I really like Alta’s idea about removing all the panels and replace with glass. That would give more of a French door effect that you had wanted in the beginning. I also like Dave Edwards’ idea for the bottom of the doors. I really don’t care for the trim above the door. To me it seems out of place since you don’t see the door facings on the sides of the opening. I don’t think it needs any trim at all. I would just fill cracks, sand and paint the opening the wall color. The hardware is the trim above the doors. I’m a fan of #1. You can do so many neat things with a large sheet of glass. This is one of my favorite door makeovers: http://theletteredcottage.net/hallway-door-makeover/. And I love the idea of a ledge below the glass, something you could easily add. Taking a page from Molly’s book, there was some grille work in the lower half of one of the doors she posted a kink to that was in the Chinese Chippendale style. It reminded me very much of the patterning of the lower tiles in your kitchen. I think you could use that as your framing, and it would be both unique and in keeping with the rest of your aesthetic. I prefer the idea of framing the window to break up the space, but don’t forget that you can use gold leaf on the glass as well. Have you considered putting glass in the doors that is the same glass as in your kitchen cabinets? 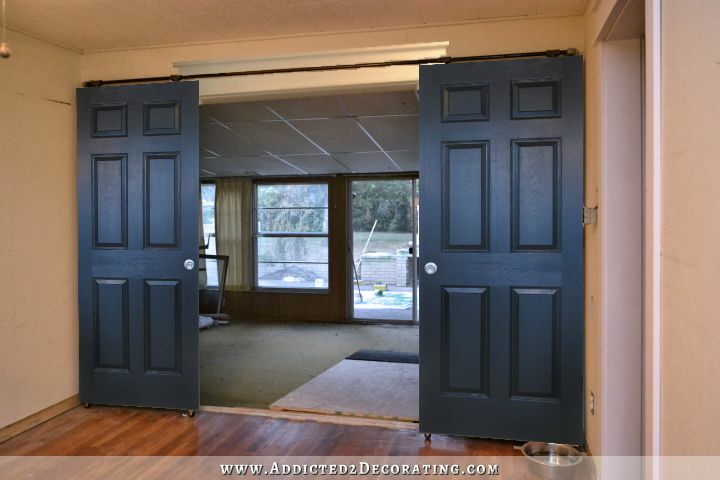 Have you considered the doors in some sort of color…not black like the rest of your planned house doors? I also like the frosted glass idea. I just sprayed our outside door (on the inside) with product from Home Depot. It has held up well. Ditto for inside house windows. Oh my gosh, the doors look awesome in black. I liked #3 the best, then I saw Molly’s option and I really like that look a lot better, it looks really elegant. Quick question about the rolling doors – how are the bottom wheels fairing on the wood flooring? Any signs of wear and tear that you can predict will be hard to live with down the road? (Yes, I have hardwood throughout.) Also, my vote is (are) large frosted or obscured in someone, single large panes of glass. Just my two and a half cents worth! I love #3 the best . Okay- those doors look navy! I can’t see the black. I loved them when I opened it up and saw navy, haha…but I’m a navy girl. I vote number 1 but I can see how the 3rd has appeal. I would #1 or #3. #1 may be an easier DIY project. I know whatever you decide it will be great!! 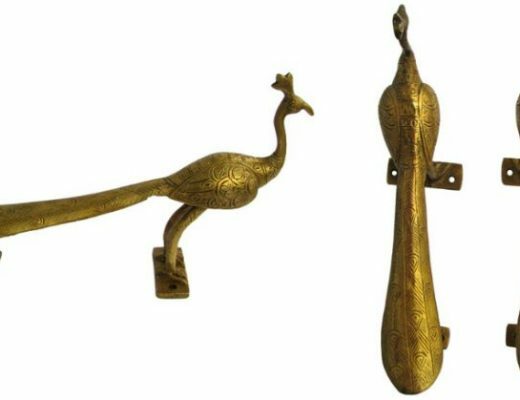 These pulls that Virgina chose on her office closet doors would be great… maybe in gold! I also love option three. Black or even gray would look good I think. I love love this DIY…I’ve been dying to do the same in my house. I would just replace the 6 panels in each door with glass. Then they would look like french doors. Glass in just the top makes them look like office doors. I like the single pane of glass. I don’t think it looks institutional at all, I think it looks classic and un-fussy. And I like the black…maybe not if you go with a multi-pane window though, where the black would take more of the visual area where the eye will be drawn. I love option #3. Thanks for sharing all your ideas. The back door of my home has the single pane of glass like your first option, with one solid panel below. So it is more cottagey? than institutional. For your home, I think the last option would look best. I also think that the green of your kitchen doors would look fine next to the teal, but that might be my monitor. Not sure how it looks in person. I’m sure whatever you select will be quite beautiful. My only suggestion would be to make sure you select tempered glass. As the doors will be sliding and butting against each other, the possibility of breakage would be greater than a french door that closed in the usual way. Love following you progress! Blessings! I like number 3 the best, particularly if you are going to go with the beautiful Craftsman style exterior, eventually. To me number 3 is definitely an Arts and Crafts-Craftsman motif. I don’t think it will clash with your kitchen. The main idea of the arts and crafts movement was that elements were handcrafted and individualized. Some arts and crafts elements had medieval or romantic aspects. Everything doesn’t have to be Craftsman in the house, but since these doors will be viewed from the front door, I think the 9 pane is very appropriate and would provide a nice link with the exterior. Number 3!!!!! The first 2 are nothing special, but number 3 is! Love the third option best. 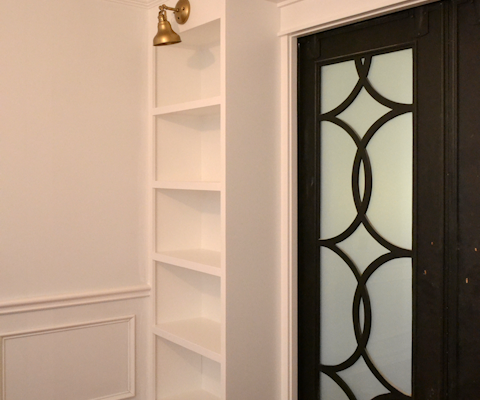 Have you considered reeded glass instead of frosted? Either would look lovely, though. Could you just cut out the raised panels on the top four sections and add glass? I like the chunkier pieces separating the panels/glass. I rarely comment on your posts except to say that you are a genius. 🙂 However, I think all three options still scream “recycled front doors” . If you have your heart set on French doors, then have faith in the universe. You never know when an affordable or even free set might appear before your eyes. Do you have a Habitat store nearby? But I personally would love to see a beautiful set of paneled pocket doors there. With your carpentry skills, you could do it. After Molly’s suggestion, #3 would be my second choice; but it looks a bit Craftsman style to me. All glass panels seem to me more in keeping with your house. What about painting these 2 sets of doors white or whatever trim color you’re selecting. That way it won’t fight the teal, the already black door, and will match the door trim and the subway tile in the kitchen. I agree that normally, the look of the dark door with a black trim would be nice, but you’re really wanting to celebrate the space and the glass on these doors and not so much the color, right??? And I like Option 3 the best for the glass…just my opinion!!! I like #3 and Alta’s suggestion the best. I love your 3rd option. I also like the black doors, I think they are awesome. The only other option I could think of is stained glass. Might be a little costly but there are ways to make ” fake ” stained glass. Sorry, I have only read half the comments. I also agree with the full French door option. Personally I would just buy those doors from a hanrdware store as they are not that expensive and it would save a lot of work. You may be able to sell the older ones also. Defintely frosted glass to keep the light in and maintain privacy. I like the third one too, and also I like a wood toned or brown matching your floors. Of the 3 glass doors I don’t like the first for an interior door but I prefer 2 and 3 is the best. I think I honestly like the solid black doors the best. I think it’s a waste to give up the privacy the doors were intended for. What if you did the same technique that you did on the chairs? The cerused wood look? That would tie it all together. I actually thought that you should do that on your kitchen floor, but the waterlock looks great! Love the black doors! I mocked up doors with the four upper panels replaced with glass and then, after reading more comments, mocked up with two long windows on top. I don’t really like #3–starting to add a whole new aspect to your house. Don’t know how to send the pics to you, but I think you might really like the two long narrow panes. Another alternative would be to use the single pane and etch a design on the glass to make it more opaque. That’s an easy treatment to do using etching cream. What about frosted glass in the top (#1) with your last name initial? I think cutting out each panel inset that is already there would look best. Then you’d have an end product the most like French doors. Two small glass windows at the upper third and four equal sized ones in the lower third of the doors. It would be easy enough to cut out- you could do it the same as cutting out the inner panels on the kitchen cabinet doors before putting glass in them instead. I have not ever commented before, but felt compelled this time. All your work is outstanding and I am in awe! I have notes in my day runner on your suggestions for the air gun and the size of the tank and the size of the brads, so that when I am ready to buy I have your information with me at all times! Do your doors have the same 6 panels as shown on these doors? I scrolled back and looked at your wall of cabinets and was thinking, did you consider leaving the center post on the door and having 2 separate pieces of glass on each door? This would tie in these doors to the wall of cabinet doors in the kitchen, if you were looking from the kitchen and it would still give you the light. And with the black doors maybe you could add the gold leaf to them. I admit I wasn’t too keen on that at first, but you won me over with the finished look!! I vote for either #2 or #3. I understand the concern about #2 looking too country, but I think the crisp black paint would modernize it… And what about frosted glass? Then you’d have both glass and privacy! I gere with Alta’s solution. Did you say you were going to have 2 sets of these sliding doors? That’s a lot of heavy black doors and I think having the panels cut out and glassed will lighten that. In fancy event, you go girl! I think the votes are all in and the clear choice is…. Remove all six recessed panels and replace with textured, reeded or seed glass, not smooth frosted. Then finish the doors in a, pardon the expression, Restoration Hardware type stripped and hand scraped reclaimed looking finish. I know your dealing with some new wood here but I also know that if anyone can make it look all the same, you can Kristi. Or even finish out the new wood frame pieces in black or done as a black iron finish that would be like a piece of art in a frame that gives even more sense of importance to the treasure they contain. This would be a very neutral look that would set them apart while still not clashing or competing with the other doors ,trim and colors and finishes in the rest of the house or from any other rooms they may be glimpsed from. There’s my 4 cents worth and then some, I can’t wait to see how you ultimately cram all our ideas and yours together and come up with something that none of us expected. Cheers! I am with Alta and Molly. Replace the panels with six panes of glass. I would do this. To me the structure of the door needs to support the “barn look” in someway so I’d go with less # of panels, with a craftsman feel that perhaps you could carry into the other doors in the house since I think you said you were going to replace them all. I’d get the door design down, then decide color. I’d also go buy the hardware to support the door style like in the previous link. I understand your desire and internal interest to support the DIY effort, but this is the one time I’d make an exception. It will be such a big statement in the home. You deserve to splurge. The last option is the best looking option for sure! Molly’s (or Alta’s) for sure. Hi. Big big fan of downton abbey. Now to the doors. I read most of the comments and see the majority leaning to number three. Nope not me I think it looks like exterior doors. I would go with number two. French doors don’t read country to me at all. Also have you considered just putting glass in the top two squares only. I think that would look chic. Privacy but letting in some light. After all they will be open most of the day especially the ones in the living room. Just another option. How about lace instead of traditional curtains like this? Can’t get pic to load but it fits with shabby chic, farmhouse style. Have you considered that when the doors are opened, you will be able to see through the glass, and see the door frame through it? Just a thought. But I like either #2 or #3 as well! I like three the best, but with more glass, as several have said. I found this on Pinterest. Others have said this, too! Good luck and whatever you decide, it will be very cool. I LOVE, LOVE, LOVE the last option!!!! I has an Arts and Crafts era look – at least to me. Now whether it would look good in your home, I’m not sure – and that’s something that trips me up a LOT when I try to make decorating choices. LOL! OMG I LOVE NUMBER 3! You must do that, I think it lends some interest and isn’t so cliche! Number 3 lets you have some interesting wood work, without blocking the view or being too plain. I think its a great compromise! Rolling doors are a wonderful idea in any design. The addition of glass is fantastic and all the options you’ve shown are great…….but what about etched glass (you could design and etch the pattern yourself) especially on option #1 and it would be perfect for option #3. You could have your glass French door look and your sliding door privacy. Whatever you do will be terrific. Just love ya’, kiddo!! I just discovered your site and really like everything on here! I want these doors for my kitchen, but I do have a question. Did you remove the door frame? Is there a way possible to install these without removing and reframing? Thanks!!! I’ve gotten so many great ideas from you today. It’s not necessary to remove the door frame. Mine is gone because there used to be a sliding glass door there, and we removed it. I still need to reframe the doorway. But if yours is already framed just like you want it, you can keep it as is.